The simple scheme of Electron Induced Fluorescence experimental setup is on Figure. Electrons produced from tungsten cathode are focused into trochoidal electron monochromator where nearly monoenergetic beam is formed (FWHM~200meV). This collides with beam of neutral molecules from capillary inlet. The reaction region is in low pressure chamber (~10-9mbar;~10-4mbar during measurements) to guarantee the single collision conditions and prolong the lifetime of electron emitting cathode. The crossing of electron and molecular beams is in focal point of plano-convex lens collimating the light emitted in electron –molecule interaction. Afterwards the collimated light passes the MgF2 window of high vacuum chamber and is focused into the entrance of Czerny-Turner monochromator. The light of selected wavelength is detected using photomultiplier tube cooled to -20°C using thermoelectric cooler. The two operation modes of experimental setup are possible. In first the incident electron energy is constant and the light emission spectra is measured through selected interval of wavelengths. The deexcitation transitions are identified. 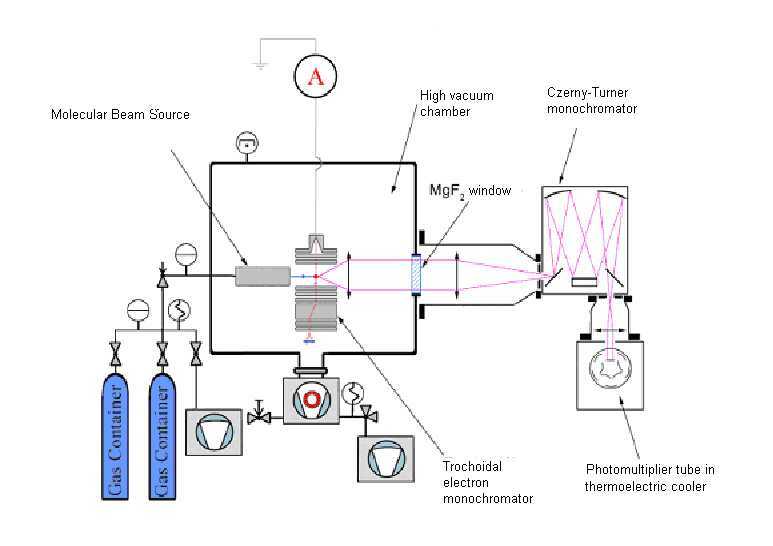 In second mode the optical monochromator is set to constant wavelength and electron energy is changing through selected interval – emission cross section of selected transition is measured depending on energy of incident electrons. Papers from the Hakone XII conference 2010: Electron induced fluorescence 2nd Positive System N2.